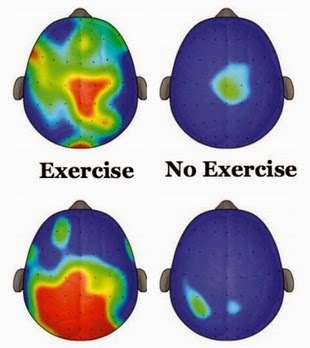 Physical movement improves mental focus, memory, and cognitive flexibility; new research shows how critical it is to academic performance. Mental exercises to build (or rebuild) attention span have shown promise recently as adjuncts or alternatives to amphetamines in addressing symptoms common to Attention Deficit Hyperactivity Disorder (ADHD). Building cognitive control, to be better able to focus on just one thing, or single-task, might involve regular practice with a specialized video game that reinforces "top-down" cognitive modulation, as was the case in a popular paper in Nature last year. Cool, but still notional. More insipid but also more clearly critical to addressing what's being called the ADHD epidemic is plain old physical activity. in the experiment and control groups. ﻿﻿﻿﻿This morning the medical journal Pediatrics published research that found kids who took part in a regular physical activity program showed important enhancement of cognitive performance and brain function. The findings, according to University of Illinois professor Charles Hillman and colleagues, "demonstrate a causal effect of a physical program on executive control, and provide support for physical activity for improving childhood cognition and brain health." If it seems odd that this is something that still needs support, that's because it is odd, yes. Physical activity is clearly a high, high-yield investment for all kids, but especially those attentive or hyperactive. This brand of research is still published and written about as though it were a novel finding, in part because exercise programs for kids remain underfunded and underprioritized in many school curricula, even though exercise is clearly integral to maximizing the utility of time spent in class. The improvements in this case came in executive control, which consists of inhibition (resisting distraction, maintaining focus), working memory, and cognitive flexibility (switching between tasks). The images above show the brain activity in the group of kids who did the program as opposed to the group that didn't. It's the kind of difference that's so dramatic it's a little unsettling. The study only lasted nine months, but when you're only seven years old, nine months is a long time to be sitting in class with a blue head. It may potentially be advisable to consider possibly implementing more exercise opportunities for kids. "If physical activity is established as an effective intervention for ADHD," they continued, "it will also be important to address possible complementary effects of physical activity and existing treatment strategies ..."
Which is a kind of phenomenal degree of reservation compared to the haste with which millions of kids have been introduced to amphetamines and other stimulants to address said ADHD. The number of prescriptions increased from 34.8 to 48.4 million between 2007 and 2011 alone. The pharmaceutical market around the disorder has grown to several billion dollars in recent years while school exercise initiatives have enjoyed no such spoils of entrepreneurialism. But, you know, once there is more research, it may potentially be advisable to consider possibly implementing more exercise opportunities for kids. Overall, the pandemic of physical inactivity, as Hillman and colleagues put it in their Pediatrics journal article today, is "a serious threat to global health" responsible for around 10 percent of premature deaths from noncommincable diseases. But it clearly manifests in ways more subtle than deaths, including scholastic performance, which we're continuously learning. I talked last week with Paul Nystedt, an associate professor of economics and finance at Jönköping University in Sweden, who just published a multi-country study that found that obese teenagers go on to earn 18 percent less money as adults than their peers, even if they are no longer obese. He believes that's most likely because of the adversity that obese kids experience from classmates and teachers, which leads to both cognitive and noncognitive disparities between obese and non-obese kids. "The rapid increase in childhood and adolescent obesity could have long-lasting effects on the economic growth and productivity of nations." John Ratey, an associate professor of psychiatry at Harvard, suggests that people think of exercise as medication for ADHD. Even very light physical activity improves mood and cognitive performance by triggering the brain to release dopamine and serotonin, similar to the way that stimulant medications like Adderall do. In a 2012 TED talk, Ratey argued that physical exercise "is really for our brains." He likened it to taking "a little bit of Prozac and a little bit of Ritalin." As a rule, I say never trust anyone who has given a TED talk. But maybe in this case that's a constructive way to think about moving one's body. But not the inverse, where taking Ritalin counts as exercise.